ProChine, ProBasic, and ProSurf are three variations of the same program that allow you to define boats and ships of all sizes and shapes, from canoes and kayaks, to yachts, to big ships. Whether you are a student, a backyard boatbuilder, or a professional designer or builder, we have a program for you. These programs eliminate all of the tedious hand fairing and calculations so you can concentrate on the design process. Think of these programs as special-purpose computer-aided design (CAD) programs for boat design. They allow you to design the shape of the boat, do the calculations, and produce construction templates all in one program. If you want to ask questions or you want to order the program, please call us at 401-423-1852 or download the appropriate full working demo of the program you are interested in. These demos allow you to save up to 25 times before they turn into a non-save type of demo program. These are the actual programs - there are no limitations. 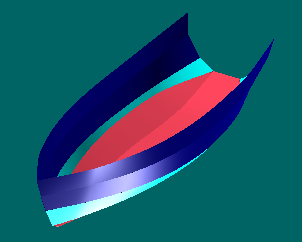 ProBasic 3 - $195 - This program is the same as ProSurf 3, but it is limited to at most 10 surfaces (per half hull) and does not include the full relational or trimmed surface capability as ProSurf 3. It does include all of the hydrostatics, stability, and resistance calculations, and it does include the ruling lines and plate development capability. ProChine 3 - $95 - This program is the same as ProBasic 3, but it is limited to just chine hull boats (no round bilge hulls). This is appropriate for those interested in developable hulls that need to be built out of plywood, aluminum, or steel. Link to our Products Section for demo download information and a Price List and Order Form. Anybody can use our programs! All it takes is a computer and a love of boats. Before you use one of our demos (or, instead of), you may wish to look at some of our tutorials. Create Boat Tutorial - This should be the first one you read. Overview Tutorial - This is also an introductory tutorial. Tutorial on Shaping and Fairing - More details! Developable Plate and Ruling Line Tutorial - Read this if you are interested in chine hulls and plate layouts. Additional associated tutorials and articles for Pilot3D - Pilot3D is the exact same program as ProSurf 3, except that all of the boat design commands (hydrostatics, stability, resistance) have been removed. We sell this program outside of the marine market. Don't overlook these tutorials because they apply directly to ProChine, ProBasic, and ProSurf. In fact, this page has a good "How To" help system with a list of one-page questions and answers.